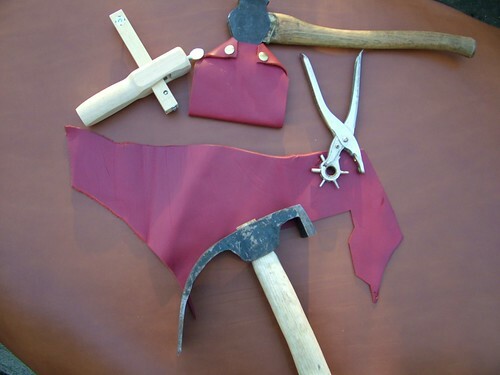 The red leather will help identification when dropped on the forest floor – always a problem with anything brown or wooden. The red scrap just cost £1.50 from a leather stockist in the next village. Axe and adze now have sheaths, I just need some rivets to stop the sharp edge contacting the inside of the sheath. Sadly all leather is now imported into the UK, I was mis-informed, as all UK tanneries have closed, in part due to the heavy pollution and health and safety controls. Much leather is imported, but there are still several tanneries alive and kicking in the UK. The brown background is a shoulder of leather that I will be using for a woven checkerboard seat on my next but one chair project which incorporates a large inverted tree fork as the back legs. While returning to the bodgery from felling on Thursday, I spotted a large forked branch in the River Wharfe, I recognized it. I had cut it about two weeks ago, and reserved it for a future project (like a chair, using a fork for the back legs!). Some one had apparenty thrown it in the river, hope they had fun. I managed to retrieve it with a branch, and secrete it at the bodgery.